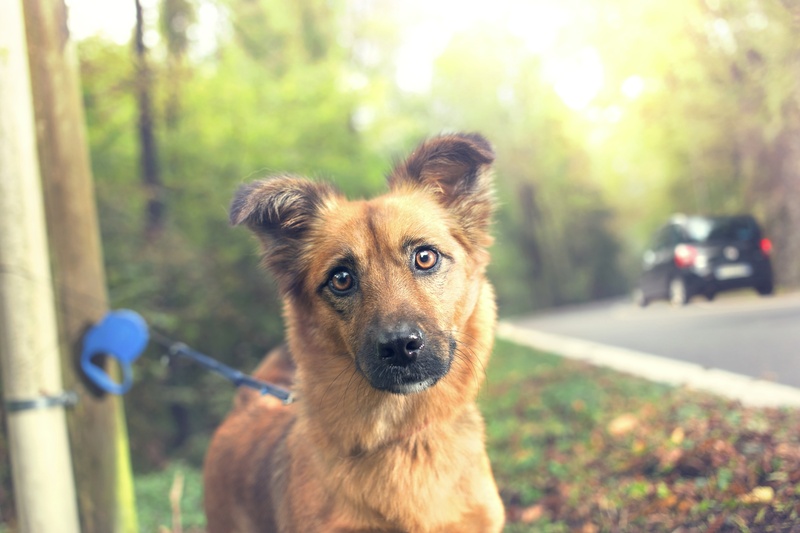 In my most recent article, I shared data that showed a chain reaction would occur when salespeople have more than one major weakness in their Sales DNA and the second major weakness is their tendency to become emotional. As a trigger, the first major weakness causes the salesperson to become emotional, at which time their listening skills become compromised. That article can be found here and as of this writing nearly 6 dozen LinkedIn subscribers have contributed some very insightful comments here. Their comments inspired me to dig even further and look into the correlation between relationship building that salespeople do and their need to be liked. In this study, even I was surprised by what I found! The table I assembled below includes data comprised of 450,000 salespeople from Objective Management Group’s (OMG) data on more than 1.75 million salespeople who have been evaluated and/or assessed. The table is sorted by the 5 ranges of Sales PercentileTM with the weakest salespeople in the percentile of 25 or below, and the top 5% in the elite group, with scores of 95 or better. The second column shows the percentages of those who DO NOT need to be liked arranged by Sales PercentileTM. You’ll notice that those scores correlate perfectly with the Sales PercentileTM, just as they did in this study of the Correlation Between Sales Motivation and Effectiveness. With the exception of the extrovert column, ALL of the scores in ALL of the columns correlate perfectly with Sales PercentileTM. Many of the LinkedIn comments referencing the article on Chain Reactions theorized that relationships either were or were not important. I mined the data on 5 of the key attributes of the Relationship Building Competency and laid them out by Sales PercentileTM in order to compare them to the findings of Not Needing to be Liked. There are some striking discoveries here, the most surprising one being that extroverts make up only 16% of the sales population. This is not an aberration. It’s the one constant in the data so say goodbye forever to the salespeople are extroverts myth! 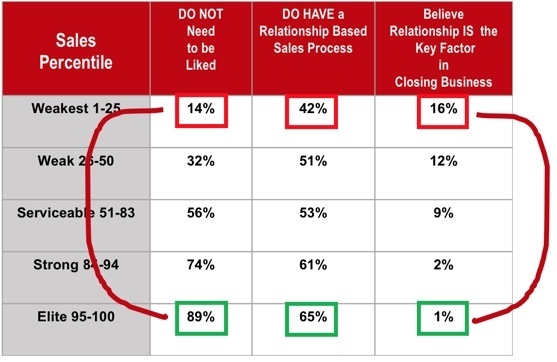 Look at the highlighted data for Not Needing to be Liked, Relationship Based Sales Process and Relationships are Key Factors in Closing Business. While 86% of the weakest salespeople DO need to be liked, only 42% of them have a relationship-based sales process and 84% – most of them – believe that the relationship is the key factor. Do you see it? Despite NEEDING to be liked, most of them lack the conscious awareness of whether or not they are successfully building a relationship during the sales process. That is one of the key reasons that the weakest group of salespeople are so incredibly ineffective. Some in this group are attention seekers while some are so timid that if you blew them a kiss they would tumble over. Either way, this is a group that you shouldn’t waste time coaching, shouldn’t attempt to raise their expectations, and ultimately, shouldn’t retain. Replace these salespeople and use OMG’s accurate, predictive, customizable, sales-specific assessment tool. Conversely, we see that two thirds of the top group, where only 11% need to be liked, DO have a relationship based sales process while only 1% believe the relationship is a key factor to closing the business. Do you see it? They DON’T NEED to be liked but are conscious of the importance of developing a relationship during the sales process. They know how (mechanical) but don’t need to (emotional). These findings bridge the gap between the two primary groups in the LinkedIn comments. One group implied that relationships didn’t matter at all, while the other group said that relationships were extremely important. It is important to develop a credible, value-based, trusting, respectful relationship, while equally important that salespeople NOT NEED their prospects to like them. I’ll be happy to do the digging and share the findings right here.